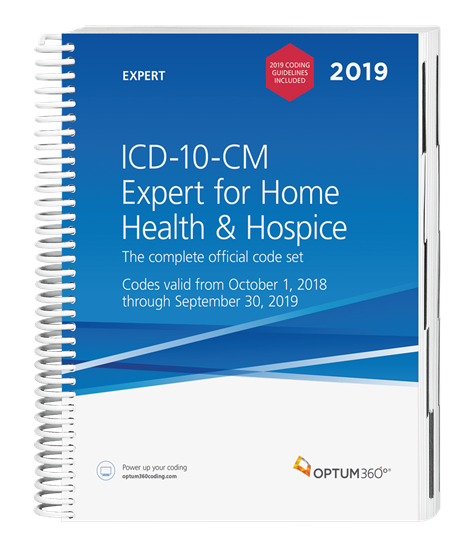 The ICD-10-CM Expert for Home Health and Hospice with our hallmark features and format makes facing the challenge of accurate diagnosis coding easier.Use the codebook that contains the complete ICD-10-CM code set and the familiar Optum360 coding and reimbursement alerts for home health and hospice including color bars and symbols that identify diagnosis codes forcase mix, non-routine supplies and non-cancer hospice diagnoses. Now with coding tips and definitions specific to home health and hospice. New — Optum360 Edge —Complete list of code changes. All 2019new, revised, and deleted codes listed in the front of the book. New — Optum360 Edge —Coding Tips. Specific coding tips for home health and hospice care. New — Optum360 Edge —Terms for conditions treated in these settings are defined. Optum360 Edge — Supplementary Appendixes.Additional information covering home health and hospice prospective payment systems, quality initiatives, OASIS-C1, and case mix groups. Optum360 Edge — Case Mix Quick Pick Cards. These handy 8.5”x 11” inch laminated cards identify case mix diagnoses, non-routine supply diagnoses, and non-cancer hospice diagnoses.